Glad Midsommar! Happy Midsummer! It has been almost six years since I moved to Sweden! Six years??!! In that time I have experienced more tastes, sights, and sounds than I ever dreamed possible. Today is one of the most celebrated holidays in Sweden, Midsummer. It is a celebration of light, food, song, dance, family, and friends. It also marks for many (especially those with children) the start of summer vacation. Midsummer is the best way to start vacation. While I normally spend Midsummer in Sweden, the past two years I have been home following my niece’s birth. The following is Swedish Midsummer in a nutshell as seen through the eyes of this expat…. According to Sweden’s official site, Midsummer dates back as far as the 1500’s. It is the Friday after the summer solstice, somewhere between June 20-26th. It is most often celebrated outside in nature. Every city including Stockholm and Gothenburg (Sweden’s two largest cities) becomes desolate as all inhabitants flood the countryside. In some parts of Sweden, especially the far north, the sun barely sets allowing for hours of outdoor celebration and games. We usually celebrate far north in Luleå, the city where my boyfriend is from. Tonight, the sun sets at 12:05 am and rises at 1:03 am allowing for only about 58 minutes of “darkness”. 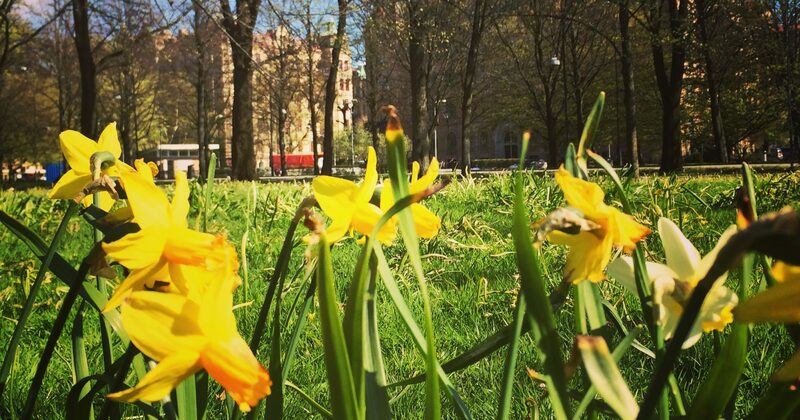 The flowers are in full bloom and this is what makes Sweden truly one of the most beautiful countries on the planet. No celebration is complete without food. Midsummer is no exception. There are many varieties of pickled herring to choose from. In addition, cured or smoked salmon with boiled potatoes, dill, and sour cream are featured favorites. Barbecuing is a must this time of year and if you are lucky and know someone who hunts moose, you may have a taste of moose filet-the greatest piece of meat on the planet. Strawberry cake or strawberry dessert of any sort is common and my favorite part of the day!! All across Sweden, towns erect a Maypole for Midsummer festivities. It is typically adorned with greenery and flowers and stands approximately 10 feet tall. The origins of the Swedish maypole are thought to come from Germany. It is said to symbolize fertility,though this is debateable among historians. Dancing around the Maypole is part of the day’s festivities. The most famous dance, Små Grådarna (The Little Frogs) has participants both young and old singing and hopping like frogs in a circle around the Maypole. Girls make a wreath of flowers using seven varieties of flowers. Legend has it that after placing the flowers under your pillow at night, you will dream of the one you are meant to marry. Day is for family, evening for friends-at least that’s how we roll. We usually spend the day with my boyfriend’s family on Brändön, a small island in northern Sweden. Following a day of sunshine, song, dance, a packed picnic, and games, we make our way to our annual Midsummer party hosted by our friends, Marcus and Maria ❤ The party continues with wine, beer, barbecue, and games. It’s funny. Since moving overseas, I always felt like I was missing out on the birthdays, Thanksgivings, Christmases. Now that I call Sweden home as well, I am really missing being “home” for Midsummer! Wishing everyone in Sweden a happy, safe Midsummer!! Here is a great summary of the day in just a few short minutes…..